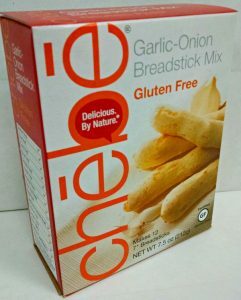 The Chēbē kitchen is always amazed at the scores of recipes we see online that can be replicated with Chēbē dough. 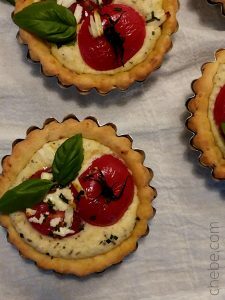 This Tomato Tart recipe is one more example. Anything that can be done with pie dough (or Pillsbury Pizza Crust Dough, Crescent Dough, and the like) can pretty much be done with Chēbē dough. 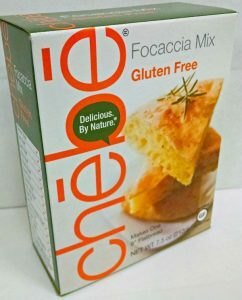 So, if you are curious, and want to see the scores of gluten and grain free possibilities, just do a search for recipes using these items. 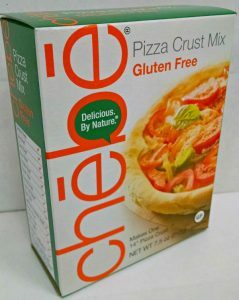 It opens the door to the hundreds of great recipes you can do with gluten and grain free Chēbē! 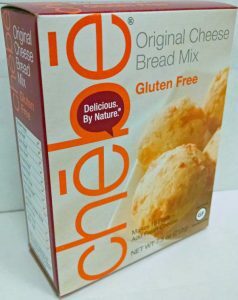 In a bowl and using a fork, blend into the Chebe mix the cheese, eggs, milk and butter/oil. Mix for a few minutes then continue kneading with your hands until the dough is smooth. Separate the dough in 8 equal pieces (about 1.75 oz each). 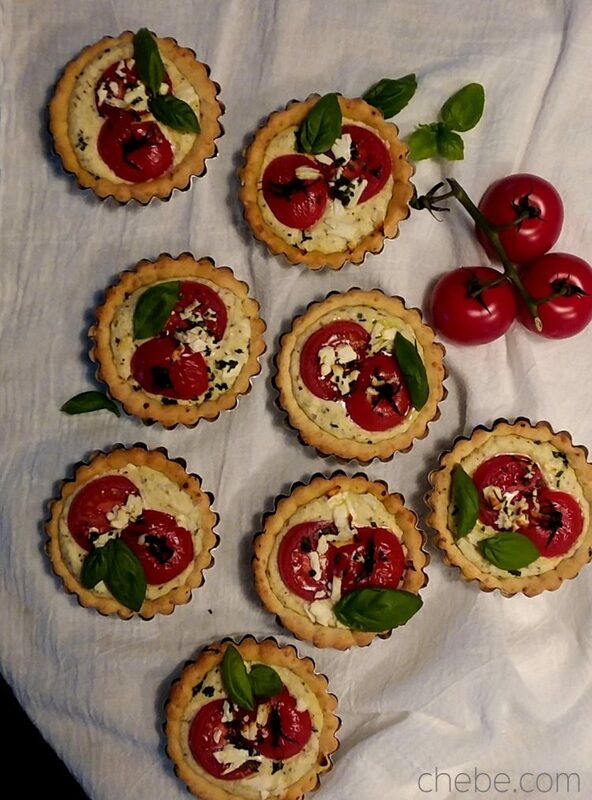 Press each piece of dough into a 3” tartlet pan**. No need to grease the pans. Poke the dough generously with the tines of a fork. Brush the surface of the dough with olive oil. 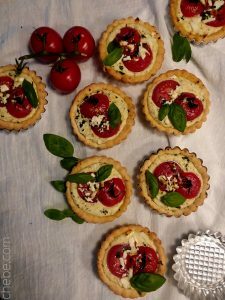 Place the tarts on a baking sheet and bake for 8 minutes. (If the dough puffs when in the oven, you can press it down with a fork.) Remove from oven and let sit until ready to fill. In a bowl, beat the egg. Blend in the ricotta, cream cheese, Parmesan, dry basil, salt and pepper. 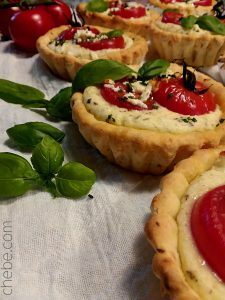 Fill the tarts with cheese mixture. Lay the tomatoes over the filling then top with the feta and chives. Drizzle with olive oil. *Size matters. If you are using a larger baking pan, you can use big tomatoes. Just use the amount that will go nicely on top of the tart(s). ** If you don’t have 3” tartlet pans, you can use other sizes, even an 8” or 9” pie pan or loose bottom quiche pan. 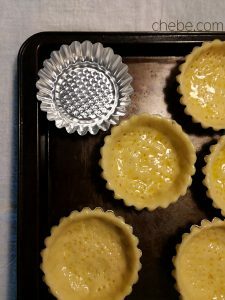 You can also use ramekins! Adjust the dough to fit the pan. The dough layer in the pan is thin (see photo). For a 9” pan, separate the kneaded dough in half and use the other half for a second pan, or form it into balls to make cheese rolls! *** If you’re using an 8 or 9 inch pan, bake for about 20 – 22 minutes.